As we design and build Local Transport Networks for our community clients, we are frequently asked, "Where will the LTP get backhaul?" LTPs do not need backhaul, because the LTP is not an Internet Service Provider. Put another way, the LTP is a broadband provider, not an Internet provider. Unfortunately, "Internet" and "broadband" are used interchangeably even though they are two different things. In the roads analogy, broadband is the single, high performance road network, and Internet is one of the trucks that use that road. But that is not to say backhaul is not an issue, as the service providers using the LTP network still need backhaul. While many smaller/rural communities still lack competitive pricing on backhaul, the consolidation in the long haul business has really helped--we are seeing more and better backhaul options in rural areas of the U.S. Introducing an LTP to a community often drives backhaul prices down and/or creates an opportunity for a long haul provider to open their fiber cable in that community. LTPs aggregate demand and help improve the business case for the long haul providers. We are working in two rural communities right now building new, modern LTP networks, and the existence of the LTP has brought about dramatic improvements in backhaul. 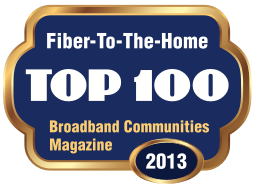 Design Nine has been selected as a Broadband Properties / Broadband Communities top 100 company from 2008 to 2015. Designed by Design Nine, the nDanville fiber network has won the Intelligent Community Forum's Smart 21 award for 2010. - Design Nine provides visionary broadband architecture and engineering services to our clients. We have over seventy years of staff experience with telecom and community broadband-more than any other company in the United States. If you don't see what you need contact us. We can help. Copyright © 2002-2011 Design Nine, Inc. All rights reserved. Design Nine™ and the Design Nine logo are registered trademarks of Design Nine, Inc.